In the last TechTip #65 I focused on flat towing. For this one, we’ll turn our attention to utility trailer towing. I am often amazed at the size of the trailers being towed behind some motorhomes. It would appear that some RVer’s see the 2” hitch receiver as their gateway to towing anything they want. The reality is that RV manufacturers specify how large a trailer and contents can be safely towed with the RV by specifying a combined trailer and cargo weight rating. 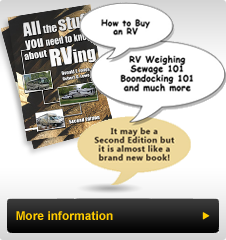 A good reference for the following information is our book: "All the Stuff You Need to Know About RVing”. The rating tag located on the sidewall to the left of the driver’s seat area contains the capacity information including what is required to determine the trailer towing capacity of the RV. Without getting too technical the coach can carry a certain amount known as the Gross Vehicle Weight Rating (GVWR) and tow an additional amount which, when added to the GVWR, gives the total amount that RV, cargo and passengers, trailer and its contents can weigh. This is the Gross Cargo Weight Rating (GCWR). The coach weighs a certain amount empty and to this must be added the weight of the amount of "stuff” including passengers that is usually carried on board (GVWR). The difference between this amount and the GCWR is the allowable total trailer and contents weight that can be safely towed with the RV. In addition the hitch receiver must be rated to carry the overall weight of the trailer and contents. I had a conversation with a RVer who had purchased a mid-1990’s non slide-out RV built on a 17,000 lb. (7,727kg) chassis. Typically these coaches weigh around 15,000 lbs. (6,818kg) empty. When the contents and passengers are added, the coach is pretty well up to capacity. This chassis usually has a 2,500 to 3,500lb (1,136-1,590kg) towing capacity. He proceeded to tell me that he tows a 22 foot enclosed trailer with his car inside. My quick calculation during our conversation was that he was towing about 10,000lb. (4,545kg). He assured me that my estimate was low however, not to fret, he had significantly strengthened the frame reinforcing the rear portion and adding steel to the chassis frame. At that spot in the conversation I stopped him and asked if was aware that he had made a bad situation even worse; by adding steel to strengthen he had taken away cargo capacity from the coach and ultimate from the trailer capacity. After a few minutes, he said that he ‘only’ tows a 12 foot trailer with a motorcycle in it, now. This setup likely left the combination overweight. I mention this discussion to emphasize that the RV and trailer must work together to start, carry and stop. Changes to any one part of the system affect the ability to safely tow. An area to pay special attention to is the tires found on the trailer and the number of axles. I recently met a RVer towing an enclosed trailer rated at 10,000lb. (4,545kg.) behind a coach that could safely tow 15,000 lbs. (4,545kg.). He had a Saturn Vue and a Harley Davidson motorcycle along with various other items inside the trailer. On the day we met him, he had suffered two blow outs within 1.5 hours. The ambient temperature was in the mid 80’s (30C). We looked at the tires and determined that they were 2.5 years old, and looked to be in excellent condition. The trailer was a double axle model which he had towed throughout the western USA over the last couple of years without any problems. We estimated the weight of the setup to be as follows: Trailer (empty): 4,000 lbs. (1,818kg. ); Saturn Vue: 4,000lbs. (1,818kg. ); the motorcycle: 2,000lbs. (909kg. ); various miscellaneous items: 1,000lbs. (454kg) for a total of 11,000lbs. (5,000kg.). The RVer had accessed tire charts while awaiting new tires to be brought to the rest area where he had stopped. He learned that the carrying capacity of the tires was 2,680lbs. (1,218kg.) per tire. This placed the tire capacity at 10,720lbs. (4,872kg.) If our weight estimate was accurate the RVer had exceeded the trailer capacity. He said the rated trailer capacity was 12,000lb. (5,454kg.). Based on the tire size and capacity, I would have expected a rating of 9,000 to 9,500 lbs. (4,090 to 4,318kg.) so the 10,000lb (4,545kg.) rating was accurate. There was a potential to install tires that had an additional 200 lbs. (91kg.) per tire, increasing the load capacity somewhat however the tire required a tire pressure that would exceed the wheel pressure rating. The ultimate solution if he wanted to continue to carry both vehicles would be to add another axle which would increase the capacity well above that he required, giving the safety tolerance required. The body of the trailer would easily accept the additional axle. My overall reading of the situation was that he required a trailer rated at no less than 12,000lb. (5,454kg.) and settled for the 10,000lb (4,545kg.) one. He proceeded to load it as if he had purchased the 12,000lb. (5,454kg.) version. The moral to the story is if you are buying a trailer to tow behind an RV, buy one rated to carry more that you plan to carry, to give the safety tolerance under all conditions. Of course, the RV must have the capacity to safely tow the trailer. Setting up to tow a trailer is somewhat simpler than flat towing a car. Once you have selected a trailer that will fit within the coach carrying capacity and carry the items you want to take with you, then deciding what type of tow attachment is next. It is critical that the trailer’s tongue be level when towing. A drop receiver with a suitable ball all rated above the weight of the trailer and contents are required. If the trailer is larger and has a load equalizing hitch ensure that the setup does not transfer too much weight to the coach. Since the trailer is a "vehicle: it will be pre-wired with all the required lighting and braking systems (if above the weight limit), and a breakaway system. I always find it interesting that when towing anything but a very lightweight trailer, the RVer accepts a braking system as part of the package, yet when a vehicle is flat towed the RVer needs to be educated about the requirement of a braking system. Since the trailer requires a small battery to activate the breakaway system, it is a good idea to include a charge line from the RV. If the RV has the seven pin blade large plastic connector it may already have the contact to provide the charge current required. Safe trailer towing requires that the load be balanced side to side in the trailer to prevent overloading any tire position. It is crucial that 10% of the trailer weight be on the tongue to reduce trailer sway. As with any towed vehicle, it is wise to have the loaded trailer weighed on individual tire scales. Alternatively have the trailer weighed axle by axle at a commercial scale.